Welcome. I am so happy that you stopped by. My garden gate is always open for you to come in and sit and relax while I share with you the inspirations for my art. We have had an unusually cold winter in Southern California - even though today it is in the 70's - over the weekend it was very cold with rain and wind. I love "using what I have and not what I don't have" in decorating my home. Recently I moved the yellow and red vintage Ralph Lauren pillows from my living room to my office. I love the bright colors and felt that they addded warmth to my office - especially on such a cold day - and they were calling for a new painting to go with them. The day was so cold that Bentley, my Studio Assistant, sat in the living room by the window where the sun was barely streaming in to try and keep warm. Since I don't have any flowers growing in my garden I looked through my photographs to find inspiration for the painting that would go with the colors in my office. I have a day bed in my office with old Ralph Lauren fabrics - blue denim - red check and red stripe and the repurposed yellow pillows with a blue stripe and red and blue flowers. 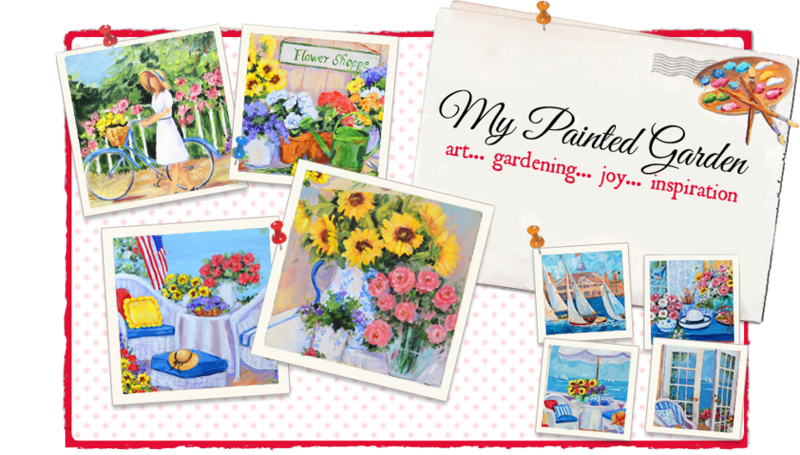 My blog is The Painted Garden and I wanted the painting to represent all things that I love - Sunflowers, purple and red flowers, my garden hat, and my love of blue and white china, and of course my favorite tea set in blue and white. Finding inspiration . . . . . . Here . . . . . There . . . . . . Everywhere . . . . . . . I used my phoptographs for inspiration for the painting with all of my favorite colors and objects. The completed painting in my office. e-mails, and those of you who follow my blog. Please let me know if you have any questions or would like to see me paint something special. 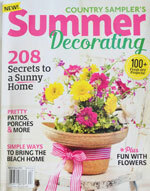 The winner of the $50.00 Target Gift Card and book, Small Space Organizing, is Elaine of Sunny Simple Life. Kathryn advised me in view of the positive responses to her book in the form of comments, e-mails, facebook, twitter, book reviews, etc. for the needs of so many of you for small space organizing that she was donating THREE autographed copies of her book to add to my giveaway. In view of this I had another drawing and am pleased to announce that the following won an autographed copy of Small Space Organizing: HOGNART, PAULA, TRACY. CONGRATULATIONS TO THE WINNERS - please send me an e-mail with your name and address to erinsart@ca.rr.com so I can mail you your prize. Bentley, my Studio Assistant, wanted me to share with you his organizing tip.Kathryn's book tells us to find creative ways to arrange furnishings and accessories to maximize space and bring harmony and style to our home. When Bentley is not in the garden looking for inspiration for me to paint he is usually in his favorite spot on the stairway landing - playing with his toys. At the end of the day his toys are neatly stored away in the vintage green tin container. Thank you for stopping by. I love hearing from you and sincerely appreciate your visits, e-mails, comments and those of you who follow my blog. Please let me know if you have any questions or would like to see me paint something special. Welcome. I am so happy that you stopped by. My garden gate is always open for you to come in and sit and relax with a cup of tea. 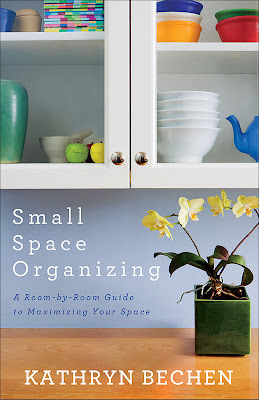 I am delighted to share a book review with you of my friend Kathryn Bechen's fabulous new book - SMALL SPACE ORGANIZING and combine it with something special just for YOU - a GIVEAWAY to help you use some of Kathryn's great organizational tips. .. details after the review. By now you have probably read that the month of January is National Organizational Month and the perfect time for releasing Small Space Organizing. Kathryn Bechen is an award winning journalist in the San Diego. California area, She specializes in lifestyle feature articles and has published several organizing and decorating ebooks. 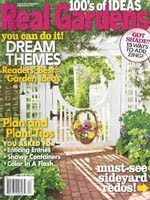 She blogs about timely lifestyle topics at http://www.kathrynbechenink.com/ . I met Kathryn in 2008 through her blog and am delighted to call her my friend. She introduced me to blogging and encouraged me to start my blog. When I met Kahryn I was working ten hour days as a busy Human Resources executive in the Aerospace Industry and trying to find time to pursue my passion and hobby - Impressionist painting. I started following her blog and using her tips on small space organizing. I learned that by rethinking and organizing my small art studio space it would free up lots of time that I normally spent trying to find things and that I could use that time to paint. I thought - WOW - Kathryn is really on to something - she should write a book and share all of the information I was learning with more people. Well- thankfully she wrote a book. Relax - have a cup of tea and I will share with you a few things in my art studio that I learned from Kathryn and that you can learn from her book. My art studio is half of my garage. 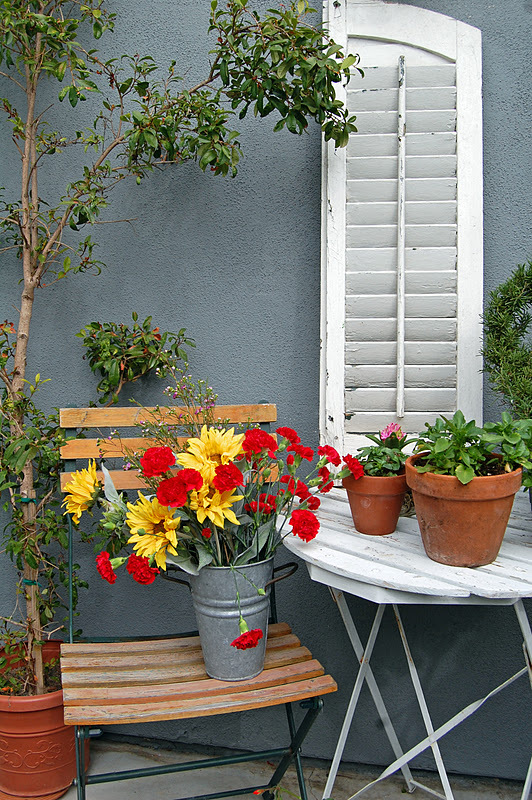 Kathryn says that "we don't have to live in rambling estates - but we can enjoy an organized, beauty-filled life no matter what the size of our space." That is what I set out to do in creating my little studio in half of my garage. I previously faux painted the floor so I had something beautiful to work with. I purchased wooden storage bins from Joanne's Fabric to store my art books, supplies, etc. in so it would be easy to find them. I also purchased some baskets from Target to use to organize my paints and stored them according to colors. Kathryn said to "make the most of existing storage space and find clever ways to add more." I was able to go up with the storage bins and make the most of my small space. 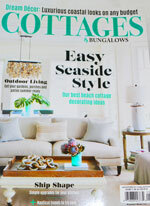 Kathryn said "find creative ways to arrange furnishings and accessories to bring harmony and style to the home." Since I am a gardener I decided to use garden containers and totes to store my paint brushes, supplies, etc. in keeping with my "Painted Garden" art studio. Have another cup of tea - I am so excited about sharing things that I learned from Kathryn and that you can learn from reading her book - I want to share one more thing I learned!!! I love books and for years stacked them up on the floor in my living room. I refer to the room as "the reading room" as I do not have a TV in the room and everyone loves to sit in the room and curl up by the fire and read and listen to music. I had the floor refinished and the carpet removed .After reading a section in Kathryn's book about using wicker baskets for storage a light went off. I collect vintage wicker picnic baskets and store them in the living room - why not store some of the books in the vintage baskets!!!!! After all - Kathryn teaches us to live in an organized, beauty-filled home and from the looks of the photo of my living room it could use a little organization. 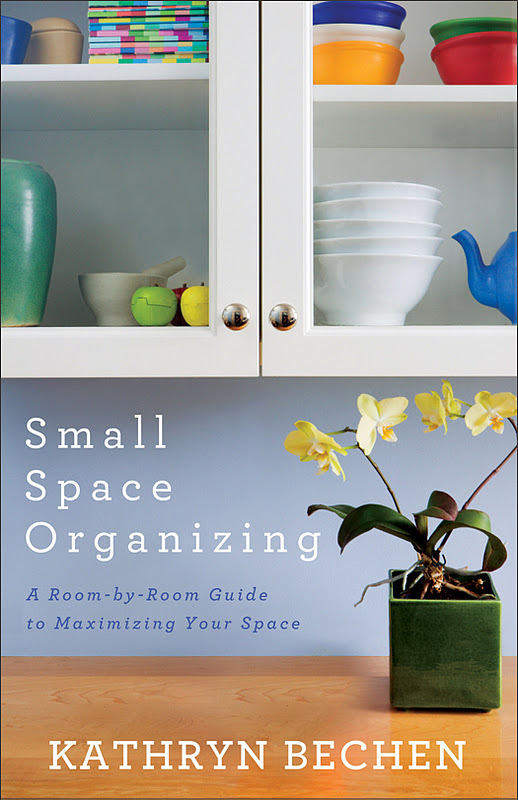 Whether you are an empty nester who's downsizing, a newlywed setting up your first nest, or someone who just needs some creative new ideas, you'll love Kathryn's book and the strategies, tips and solutions to maximize space and enhance your quality of space. 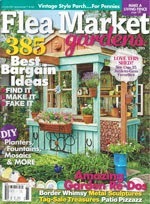 I can personally recommend how helpful her tips have been to me in helping me organize my small space since 2008.
http://www.kathrynbechenink.com/ to learn about all of the ways to purchase her book. You will love her FREE e-newsletter where she posts excerpts from her book the first of every month. Thank you for stopping by. 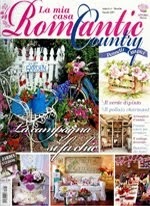 I love hearing from you and sincerely appreciate your visits, e-mails, comments and those who follow my blog. Please let me know if you have any questions or would like to see me paint something special. Welcome. I am so happy that you stopped by. ﻿My garden gate is always open for you to come in and sit and relax with a cup of tea while I share with you the inspirations for my art. I receive lots of requests asking how I design my paintings and what I use for inspiration. I am inspired and paint the beauty of God's everyday creations - flowers - gardens - blue skies, and the ocean. 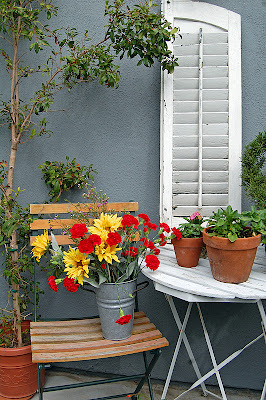 I love flower markets and little road side stands selling fruits, vegetables and flowers, picket fences and window boxes with geraniums spilling over the edge. I am photographer and have a large collection of photographs to use for inspiration during the winter months when the garden is bare. 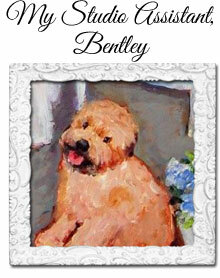 Let's join Bentley, my Studio Assistant, and I will share with you some of my photographs that I will be using for inspiration for a flower painting. There . . . . .
My completed painting using inspirations from some of my photographs of flowers. Thank you for stopping by. I love hearing from you and sincerely appreciate your visits, comments, e-mails and those who follow my blog. Please let me know if you have any questions or would like to see me painting something special.